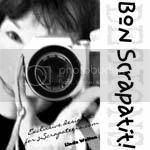 I have been having the most wonderful conversation tonight with Linda at Bon Scrapatit on her new Pingbox. I can’t believe how much we have in common. She is such a neat Lady and I am so blessed to have the opportunity to get to know her a bit more. She even got me addicted to this Pingbox thing. I’ve never really IM’d with anyone before so to me, this thing is pretty cool. So look what I now have (to the right) right above my cbox. That’s right, I have a Pingbox. So since it’s late and I have a restless little one tonight, I’m going to borrow the instructions for the Pingbox from Linda (thank you sunshine, I owe you one). I will type up my own little blurb in the morning. Some good news tonight, my boss’s mother has been released from the hospital. She is being moved to an assisted living apartment for the time being until she is strong enough to live in her own house. Good news is they believe they did in fact remove all the cancer. Thank you to everyone who sent prayers her direction. I know the family is forever grateful. Today I have for you my first commercial use freebie! (Yippie!) It is a pumpkin overlay from the recent trip the boys and I took to the pumpkin patch. I would love to hear you comments about this overlay, if you like it (...or not, sniff sniff). LOL! This overlay is from my Pumpkin Patch Overlays set. The set includes corn, hay, sunflowers, pumpkin texture and pumpkins. All pages are saved in .png format, sized 12 x 12, and 300 dpi. You can purchase my Pumpkin Patch Overlay set in my store. OMGosh Stacy!!! You ARE a TOTAL sweetheart FOR SURE! You will not believe that I've just now finished up my blog post (I started my freebie just after our chat) and I popped over here to copy and paste your blog link in my post about YOU!!! ROFL! Great minds think alike or either that, we REALLY had a GREAT time chatting!!! How about BOTH of those!!! LOL! I am LOVING the look of your FIRST CU freebie and PUMPKIN OVERLAY Stacy!!! I am snagging it NOW and will give it a go tomorrow! THANK YOU for sharing with ALL of us here in SCRAPLAND!!! Hope you are getting a VERY good night's sleep and having dreams of gold! Have a GORGEOUS day and I'll catch up with you soon! Thank you. Just found your blog from BonScrapatit. I love real photo backgrounds. I'll have to check your store to see if you have any others. Thank you so much. thank you for sharing...oh I gotta get one of those ping boxes..what a great idea..
this is great! Thank You! I remember the days of pumpkin patches with my kids when they were little. Now one is in the Air Force and another in college with the third in middle school. Actually might have to still do a pumpkin patch with the youngest one yet. Getting them at WalMart just doesn't cut it! LOL! Thank you for the CU freebie! I appreciate it! Great job on the overlays and the spookerific kit. Looks like the boys enjoyed the pumpkin patch and train ride very much. Thanks for sharing your talents.